Jet lagged babies are no fun. Christmas Tree shopping while it snows. Finding the perfect tree, sausages with homemade bread and hot Gluehwein. Logan has a mean cold with a nose that won't stop running and a miserable mood. Poor baby. He hates getting his nose wiped and has the hardest time falling asleep. Needless to say, this momma is not getting much of a break either. After giving the little man his bath last night, I got to soak in the tub for 10 minutes. Heaven! I don't remember the last time I had time for more than a quick shower. Thanks to the hubby for getting the little man ready for bed all on his own. I forgot how weird Germans can be... Don't you dare make eye contact or say hi to anyone while out on a nice long walk. They'll just look at you like you're from Mars. I love it here but I sure love the friendly talks I have with total strangers in check out lines back home. LOVE watching my brothers with the little man. They are such great uncles and I'm so glad they finally get to spend some time together. Getting ready to go to the Christmas market now. Can't wait to see the lights and enjoy the snow. 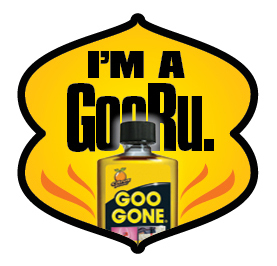 A few weeks ago I was contacted by Goo Gone brand and asked to become a Goo Gone GooRu. I have been contacted by other brands before but they never seemed to be something that I wanted to support or write about. I don't mind telling the internets about products I like and I always like getting recommendations and opinions from others. I really do use Goo Gone quite a lot to clean up messes around the house, vintage finds or for craft projects. I hate whenever I remove stickers and a sticky mess is left behind. I used it last when I was working on my DIY yarn wrapped jars to take the goop off of the glass. Always works like a charm. So they found my post and now I am the GooRu of the week over on their Facebook page. Go check it out here and also find out how you can become a GooRu yourself. PS: They did NOT ask me to write this or any other post. 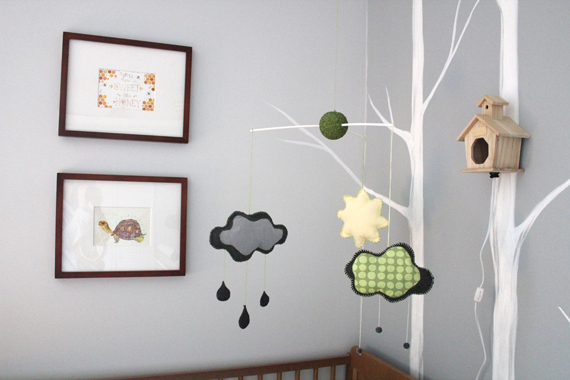 So here is part two of the nursery tour. This is the other side of the room where the closet is. Since the room is so small, the closet pretty much takes up the entire wall. We added some shelving from IKEA above the doors and in the corner to hold his books and some toys until he gets his bookshelf. The bookshelf will go on the wall underneath. The little rocking chair is vintage and has a music box on the bottom that plays when it's rocking. The diaper pail also came from IKEA. 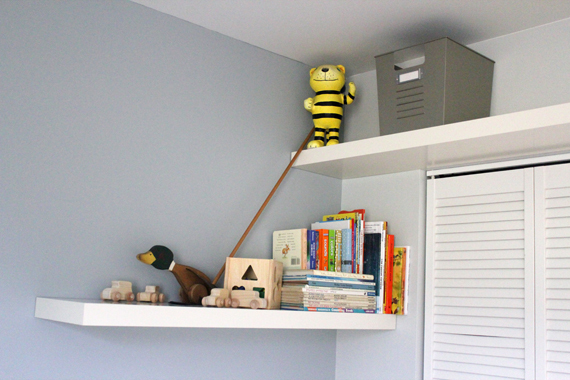 The metal organizing bins are from Target and the cute papermache tiger is a children's book character from when I was little. My mom got it for me at a store closeout sale where it used to be for decoration. The 3 little black corner cubbies were a Christmas gift we got a few years back and never used. 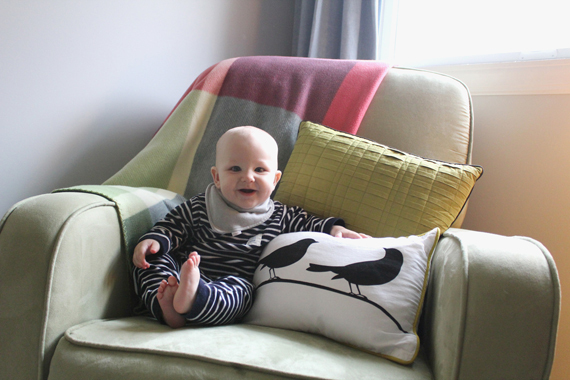 I used the same fabric I made his pillowcase from and backed each cube using a glue gun. Super easy! 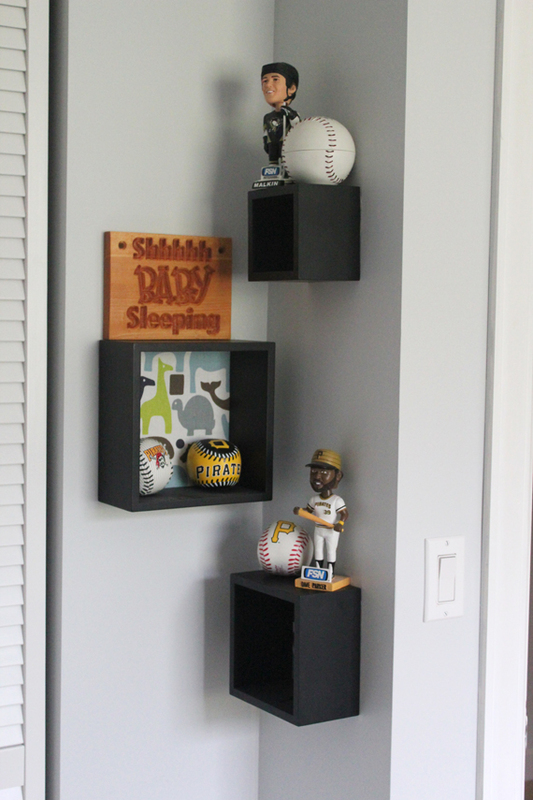 For now they hold all of the sports related items the hubby wanted to put in the room. Also, the cute wooden sign was made by a family friend and we are still planning to attach it on the outside of his door. So that's it so far. This is probably the most cohesively designed room in the entire house. It has been so much fun putting everything together and I think he will be able to enjoy this room for quite a few years. 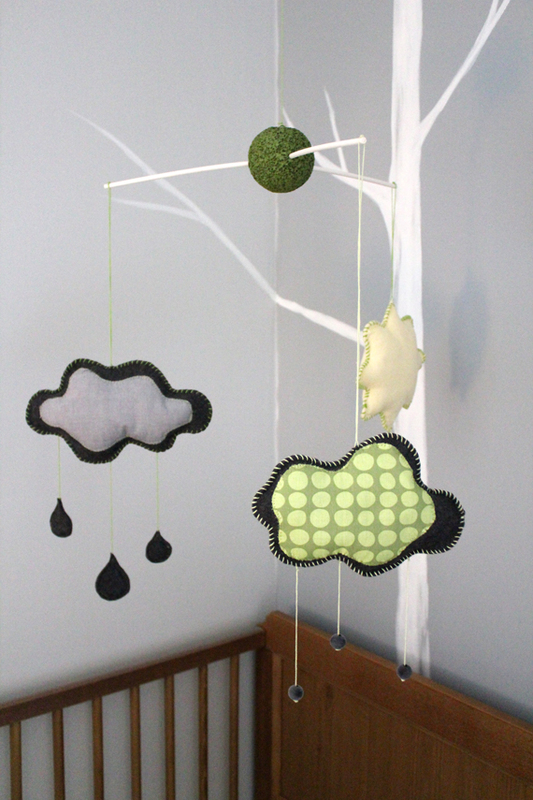 I will post step by step instructions on how to make the mobile next week. 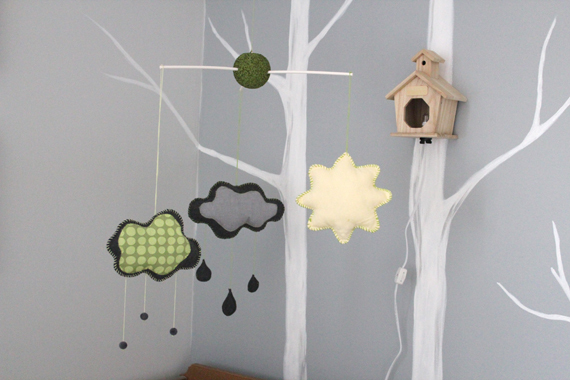 I thought I'd give you an update on the little man's nursery. I really love how everything came together and now all we're still waiting for is his bookcase. His grandpa is making it for Christmas. I will split this post in two since there are a lot of pictures. His room is on the north side of our house and even though it has big window it is a small room and doesn't get very much light. The room is about 10'x10' and won't ever be a great play room but we are planning an addition to the house within the next few years, so eventually he will have more than enough room to play. For now it's just the right size. 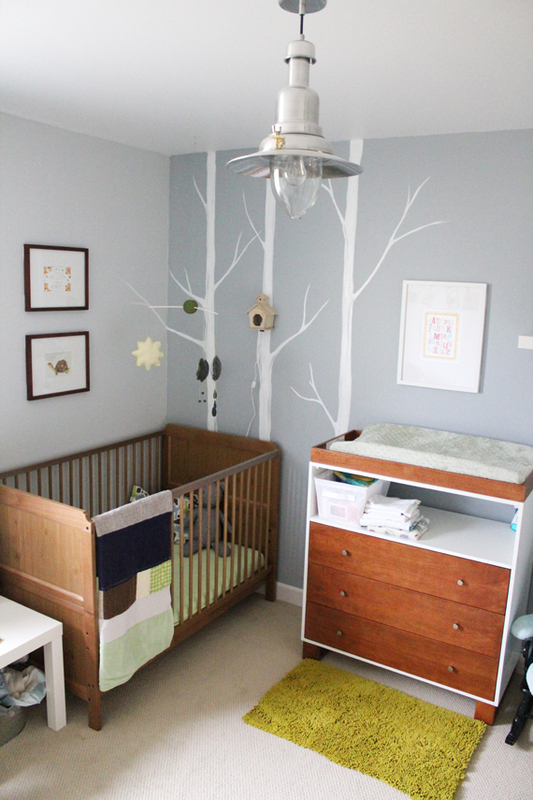 We used two different shades of gray for the walls. 3 walls are in a light gray and one wall has a darker more bluish tint to it. 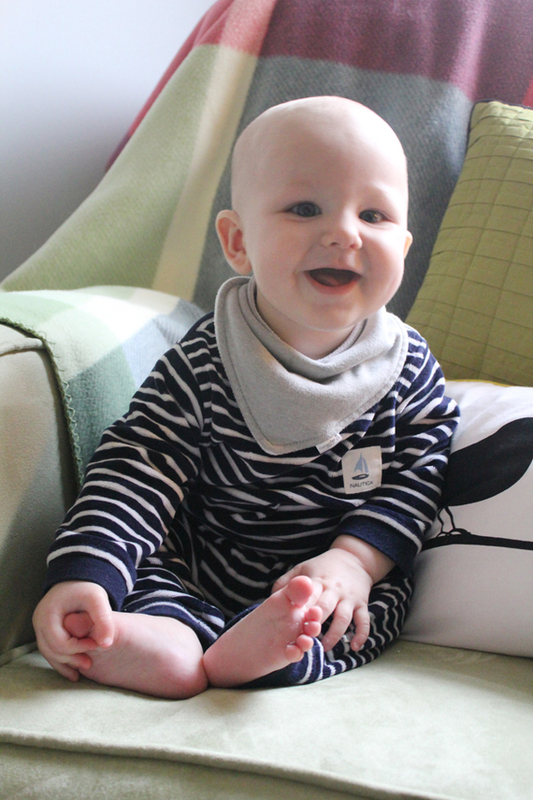 One of the first things I bought Logan before he was even born was a blue and white railroad striped teddy bear from Pottery Barn Kids, which was kind of the inspiration for the rest of the room. I painted the trees myself and we just recently added the little tree house with the nightlight inside of it. I got it at Michaels for $2.50 on clearance and we got a light kit and bulb and made it ourselves. I still plan on adding some sort of plexi and maybe staining or painting the wood. 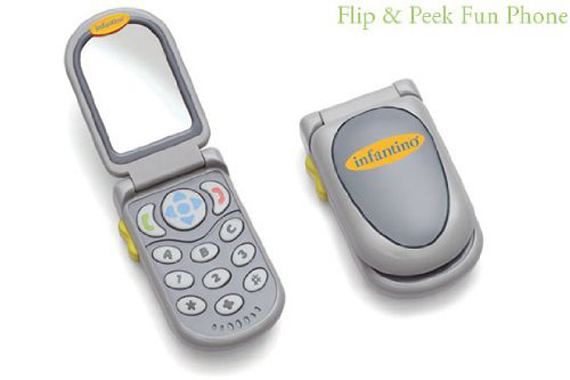 The mobile was also made by me. I will post a DIY on that sometime soon. He loves it so much he always stares and laughs at it after I get him out of bed. 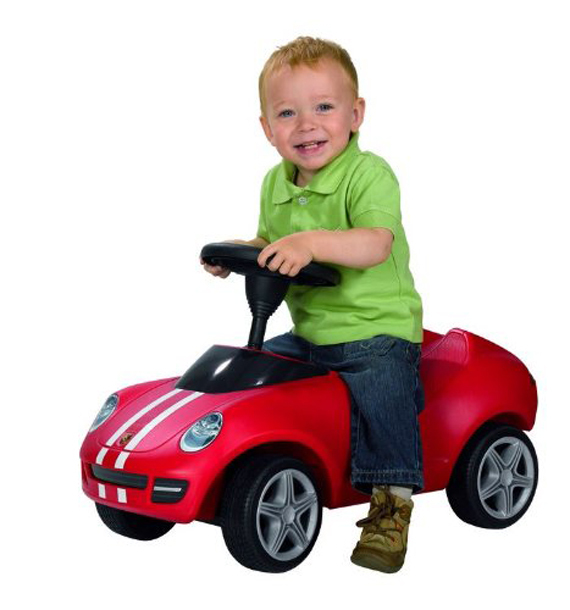 The wonderful glider is from Babies'R'us and by a company named Newco. We had a hard time finding the right one and it was a huge hassle getting this one but it was so worth it. It swivels, reclines and rocks :) The pillows are from TJ Maxx, the blanket used to be my grandma's. 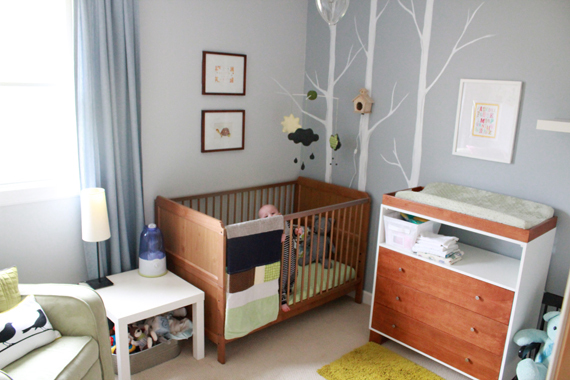 The framed prints are by a wonderful artist named Katie Daisy and the crib is very budget friendly from IKEA. 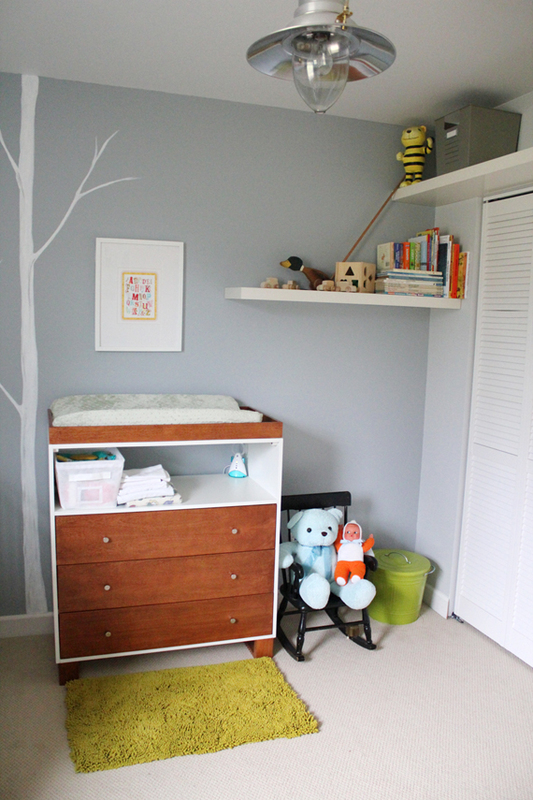 The changing table came from Babies'R'us as well. 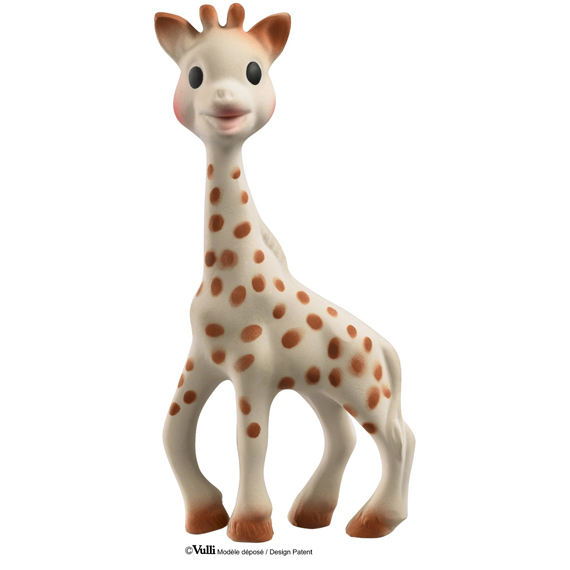 It was a floor model but unfortunately it is way to high for me to change him on anymore. Now that he wiggles, tosses and turns and diaper changes have become a nightmare, I wouldn't dare change him on that thing. It is probably the one item I regret purchasing, not so much for the look but for the actual use that I haven't gotten out of it. I also made the patchwork quilt myself and the floor rug came from TJ Maxx. He loves feeling the texture of it and it is super soft. The little white table and table lamp are from IKEA and we used to have them in the living room as starter furniture after we first moved in. The ceiling light and blue chambray curtains were also IKEA finds. We got an oval galvanized bin at our home improvement store to hold his toys and stuffed animals and keep it underneath the table. 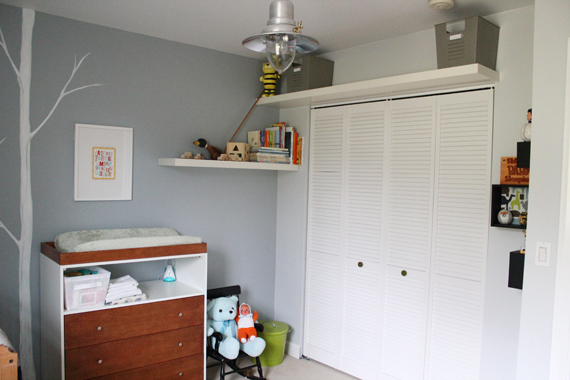 What do you like most about your kid's room? 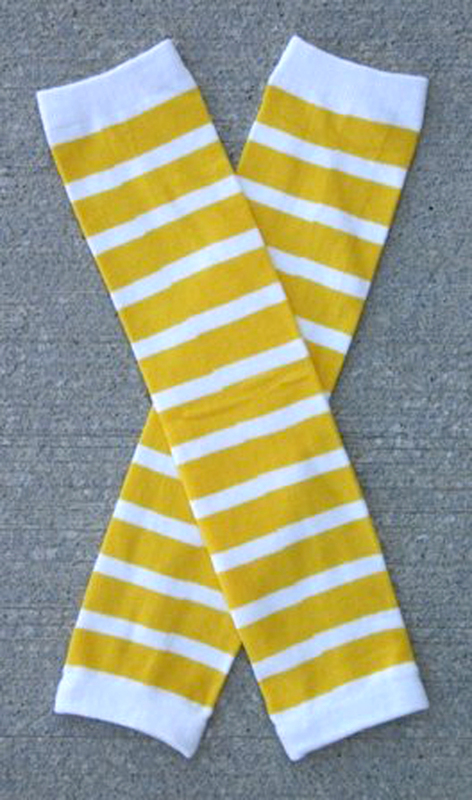 These reversible scarfs are super easy to sew and only take a few minutes to make. 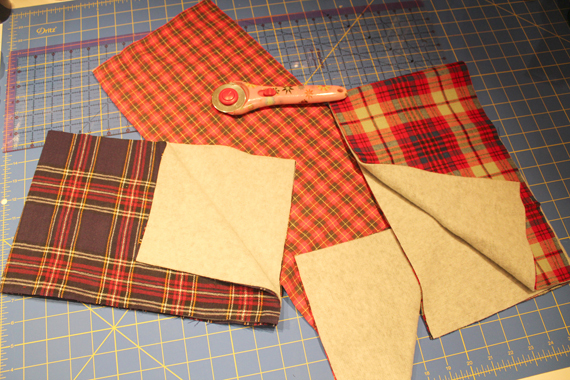 I got my fabrics at the fabric store where the fleece was half off and I had a coupon to use on the plaid fabric. Overall the fabric probably cost $7. I bought a few different colors of the plaid so I spent a little bit more. 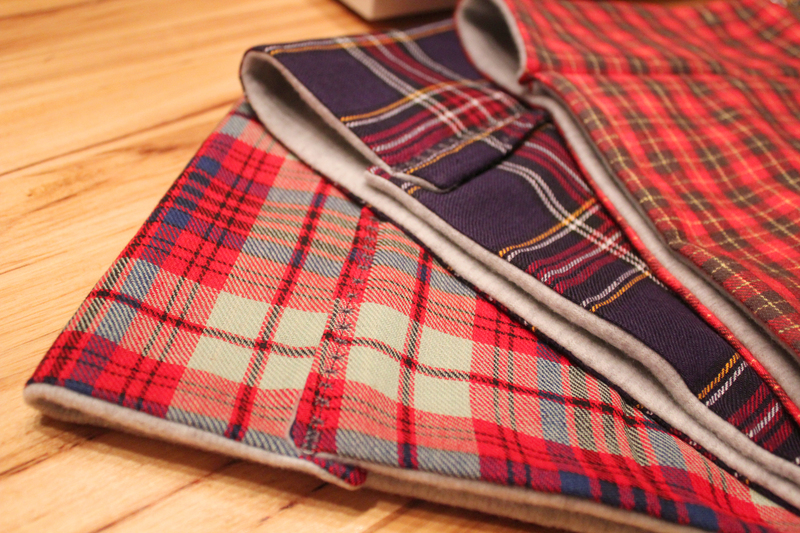 Out of both fabrics cut a piece each that is 25" long and 9" tall. That will give you enough space for a 1/4" to 1/2" seam allowance all around. Since both fabrics are the same on each side it doesn't matter which sides face together. If you're using a fabric with a right and wrong side make sure you line up wrong sides facing each other and sew all the way around leaving a 2" opening to turn the scarf inside out. Cut the corners off (be careful not to cut your seam) which will make your corners look nicer. Iron the whole thing flat and sew the opening closed with a hidden stitch by hand or use your machine if you don't mind the extra seam. To create the circle I just overlapped my ends about half an inch and sewed down straight with a decorative stitch. With one I lined up the ends and sewed down with a straight stitch. The scarf can be worn on either side. Super easy and hopefully something my men will enjoy. I've been working on a lot of handmade Christmas gifts the last few weeks and I thought I'd share this easy DIY with you. I apologize for the awful pictures. 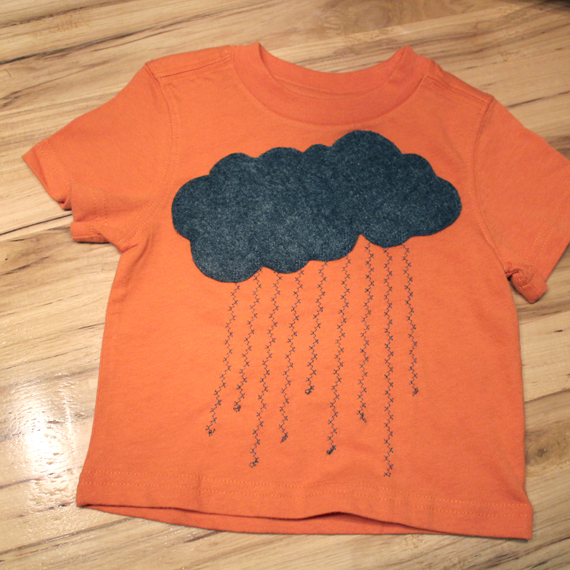 Most of my sewing now happens at night after the little man goes to bed and the lighting is therefore pretty crappy. I hate using the flash even when the lighting is bad since it makes the pictures even worse, in my opinion. 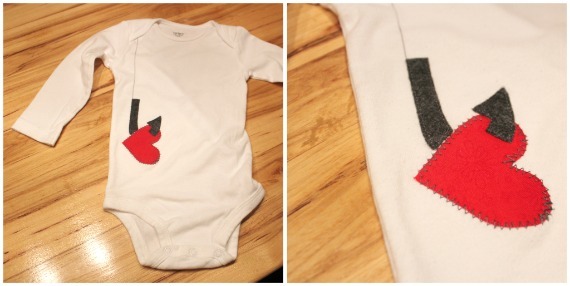 So I made this cute appliqued shirt and onesie for Logan. I already had a set of long sleeved Carter's onesies I got at TJ Maxx a while ago and the shirt was $1.50 on clearance at Target. I also had all of the felt, fabric and iron-on backing on hand. 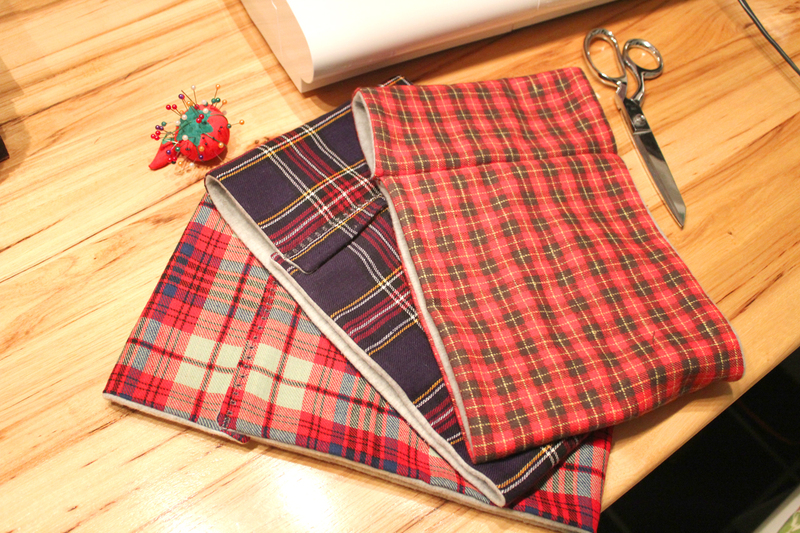 I use the iron-on backing because it makes it so much easier to sew when it is in place and can't move. It also helps to prevent fraying with cotton fabrics. 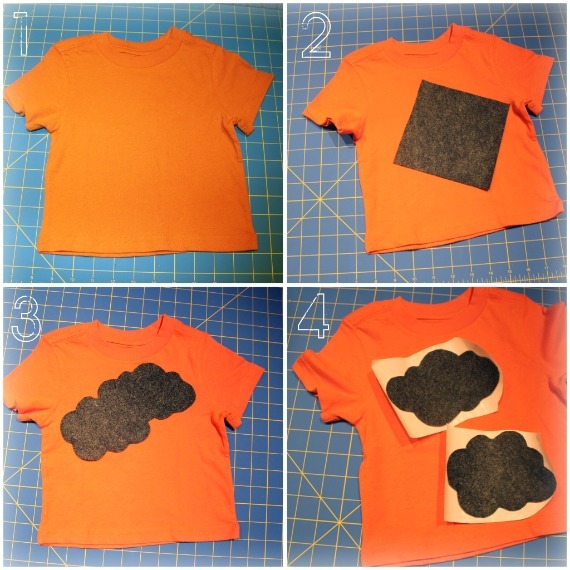 1 - get a shirt in the right size and pre-wash.
6 - sew around the shapes in your favorite stitch, do this slowly if you are a beginner and just move your fabric as you go. it also helps to lift your machine's foot a little while you sew or to lower the needle and lift the foot and adjust your shirt when you go around corners. 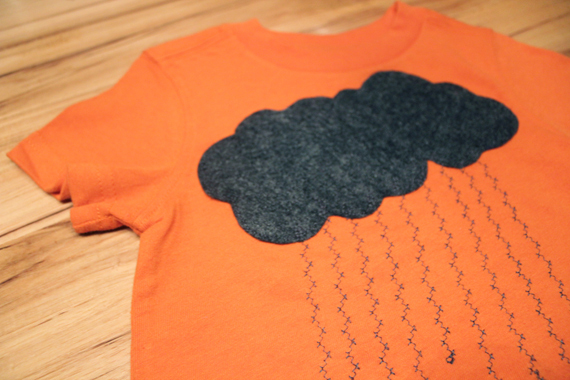 7 - i used one of the many stitches I never get to use for anything else to stitch the rain. a straight stitch works perfectly fine if you want to achieve a more simple look. 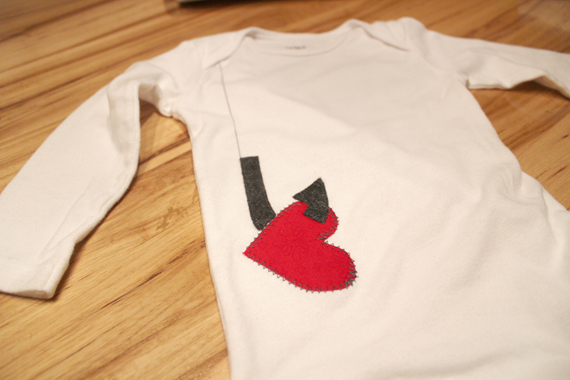 For the onesie I cut out a red fabric heart and used felt for the hook. I zigzag stitched around the heart and straight stitched the hook and fishing line. I don't have too much to say today. Most everything that's been going on recently has to do with the little guy since we were stuck in the house for the past days because it won't freakin' stop raining!!! The hubby had to work and also went to his Company Christmas Party - no spouses allowed :( bummer. Yes, my brain is full of craziness, overspilling with last-minute Christmas gift ideas that I need to complete before we leave and 3 long packing/to-do lists (one for the babe, one for us and one for the house). Can't we just already be there? Kind of "beam me up Scotty" style? 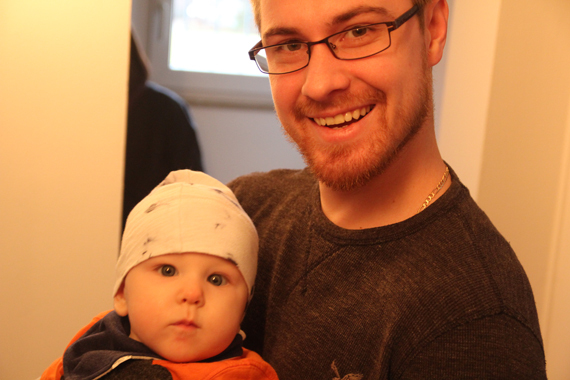 I've been studying all kinds of 'flying with infants' tips and I am sure I will come up with my own after the trip. I am praying he will sleep and that the flight won't be full so we may get an extra seat. So why is this post titled Happy Tot you ask? Well, in the process of getting ready for the big trip and trying to figure out how to feed the little man on a plane, on my lap, in a very restricted area, we came across these food pouches. 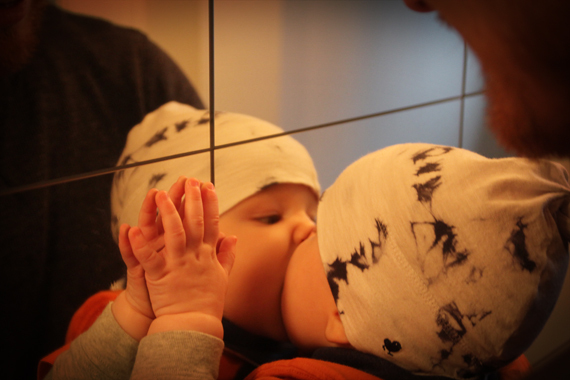 Since Logan is only 6 months old we wanted to give him some time to practice holding and feeding the pouches to himself. Man does he ever love those things! I am not sure if it is the fact that he can feed himself or if they just taste so delicious to him (i tried them and they taste way better than regular baby food). It only takes him a few minutes to eat a whole pouch and he always wants more. 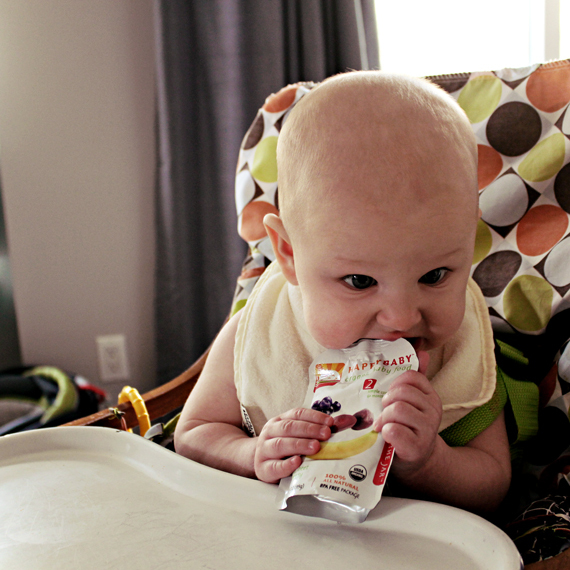 They are organic and the Spinach, Mango & Pear is his favorite. At $1.19 a for a 4.22 oz pouch they are a little on the expensive side but out of all the organic food pouch brands we found they were the cheapest. 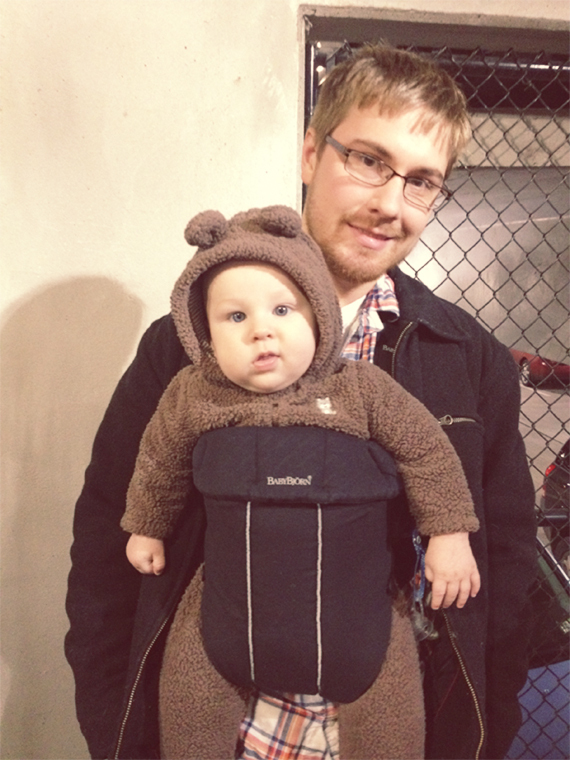 Any recommendations on traveling with a 6 month old? 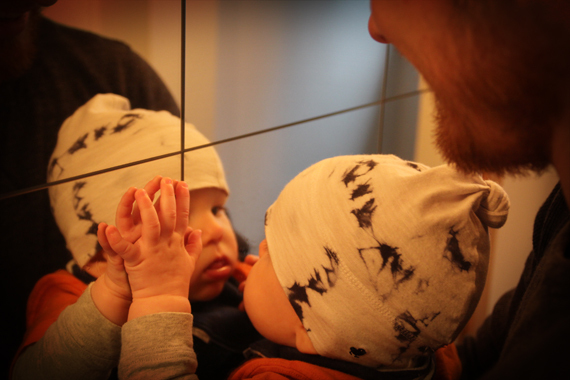 Oh, and this post is NOT a sponsored post, ( although I would totally be ok with that ;) just sharing one of our favorite baby products. 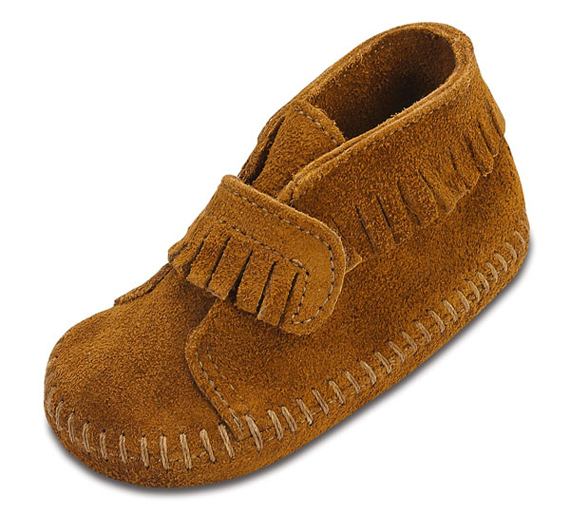 Logan is getting these Minnetonka Moccasins in size 3. They run pretty big so he has time to grow into them. Now that he's crawling around all day long I think these leg warmers may come in handy. No more carpet burn. 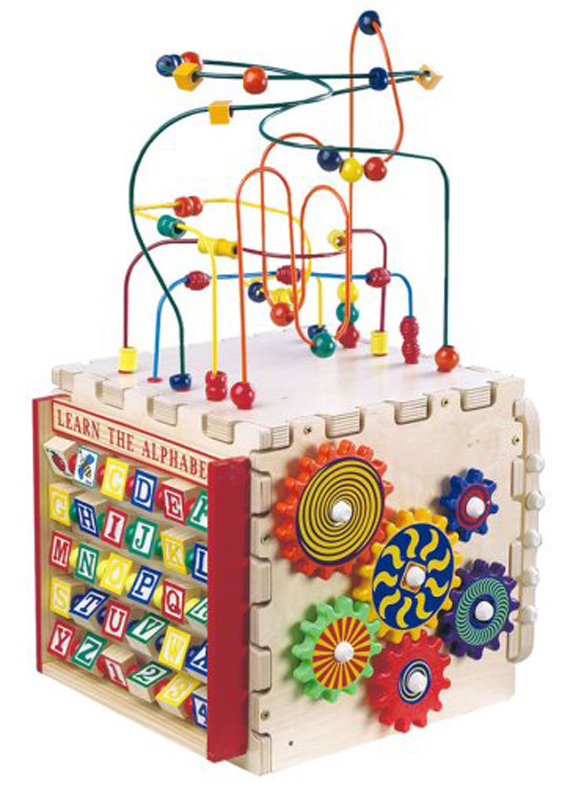 This Anatex bead maze activity cube looks like hours of fun. 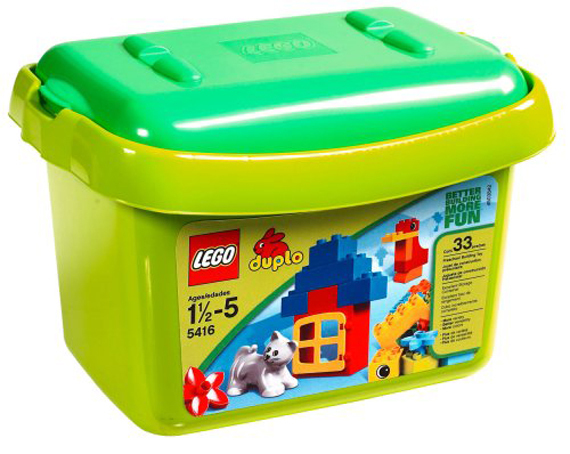 It's never too early to start with some Duplos. 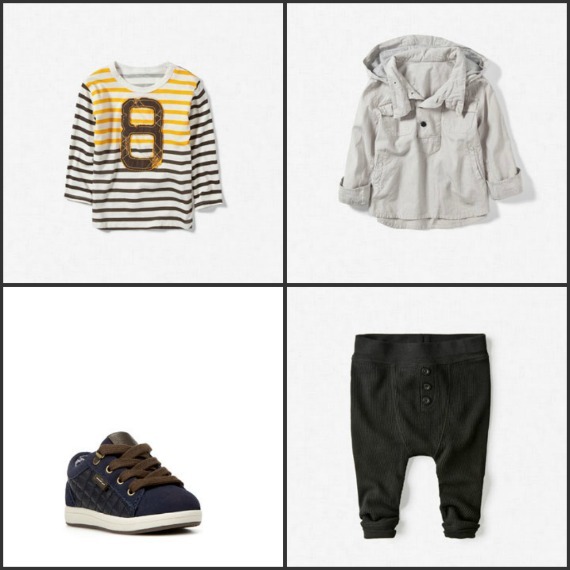 And then of course anything from Zara will do. Here are some of my faves. Can't wait to go shopping in Germany. These were on clearance at 77Kids and I had a $10 coupon. 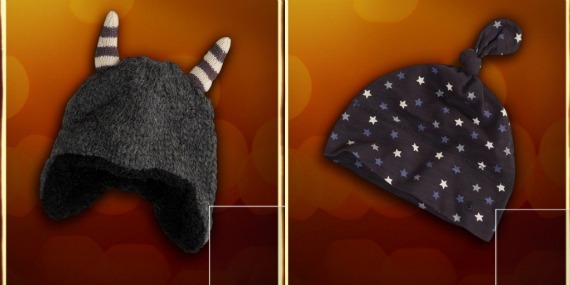 We love the soft knit hat on the right. I bought one in a blue tie dye pattern before he was even born and he wears it all the time. It's super soft and stretchy. He's been wearing it for months. 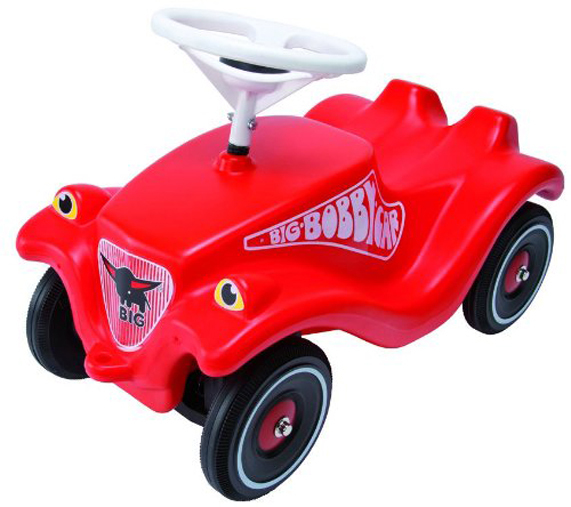 And then there is the Bobby Car. 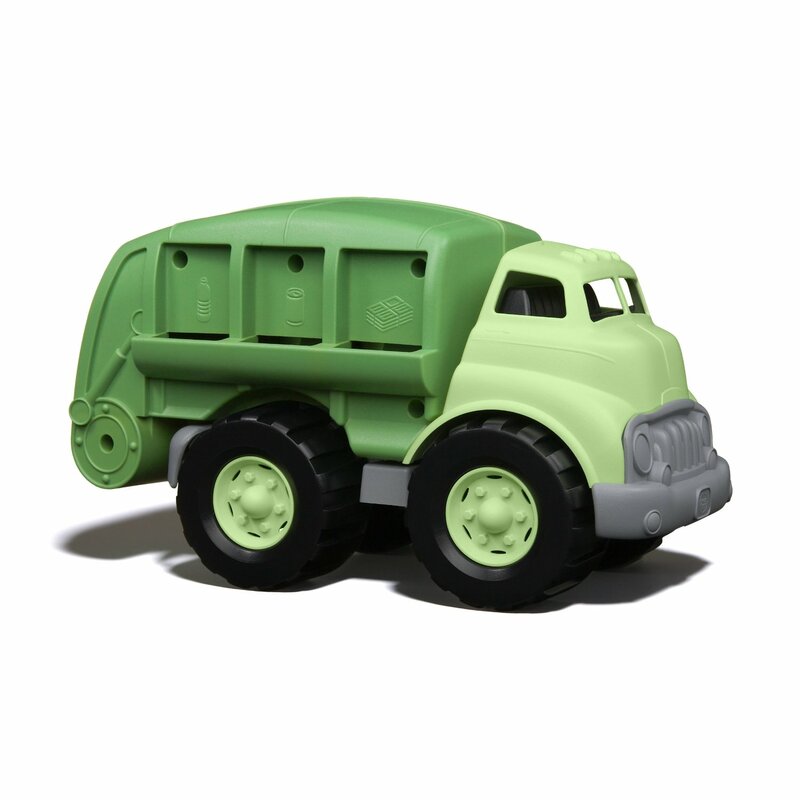 A toy that probably every German kid of my generation had. 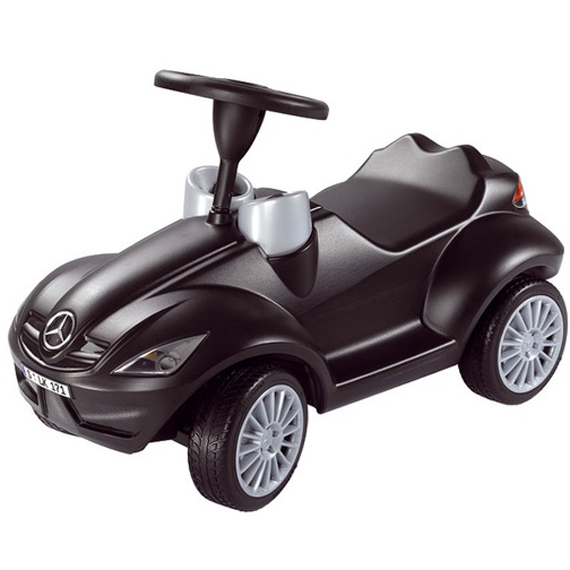 I remember ours was the original red but how about that Bobby Benz SLK??? Bet you daddy would be pretty jealous. And are those cup holders or just the speedometer? So that's the list. Any other recommendations? 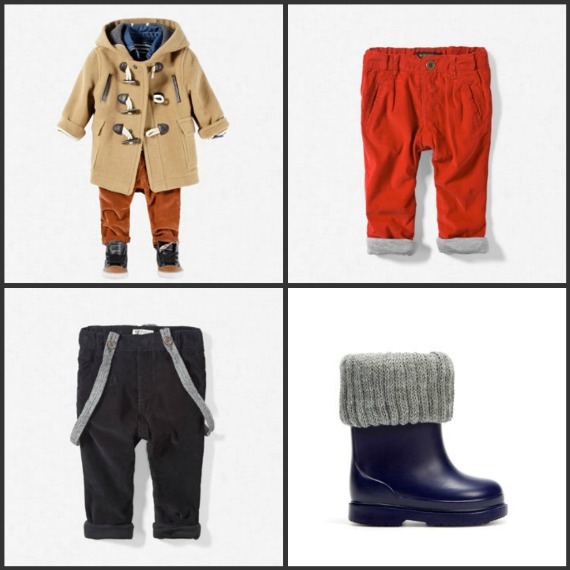 Anything my little man has to have? I can't wait for some real snow :) Hoping we'll have a white Christmas with my family in Germany. How pretty is this? 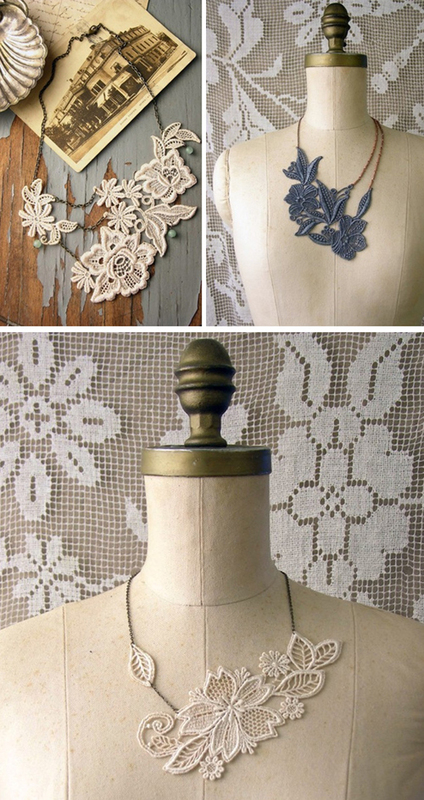 Gotta keep an eye out for some vintage lace. 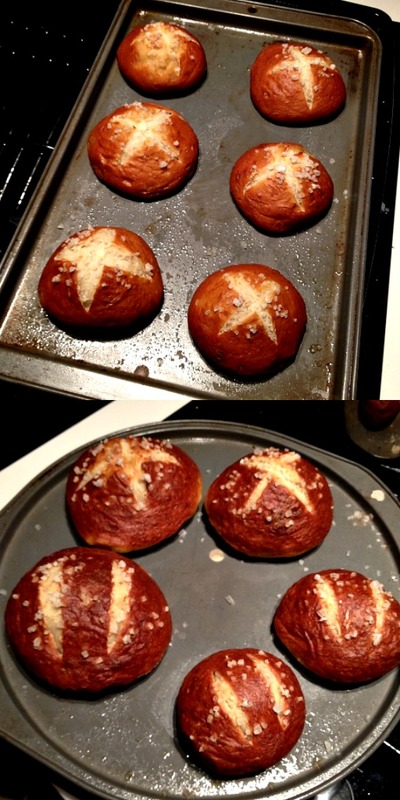 We made these last week and they turned out delicious. Just like the real thing, I should know ;) Just in case you are making this, I had to add flour to the original amount in the recipe. The dough was very sticky so I just added more until I could handle it well. 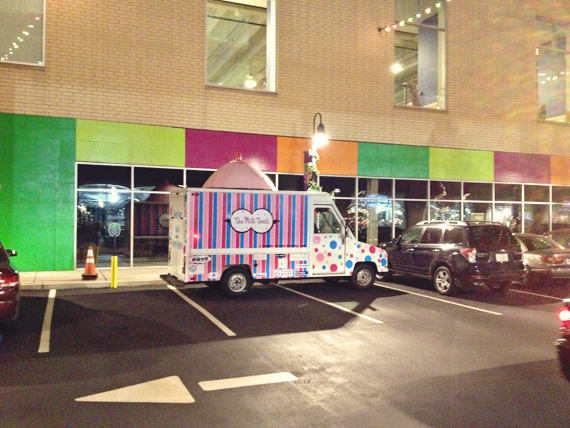 Here is how ours turned out. Not as pretty but delicious nonetheless. Our week was busy. Busy not because we had so many places to go but because the little man is becoming crazy active. He just won't slow down. He wants to crawl everywhere and he climbs onto everything. He can only be contained in a pack'n'play or jumper for so long before he starts fussing and wants to roam around the house. He has also started fighting sleep again so that's been a big pain in the behind. It's a lot of fun playing with him but it's also a lot more work now. 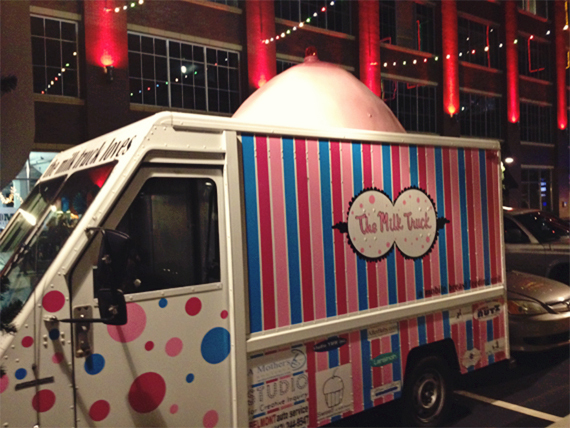 Last night we went to the "I made it! for the holidays" market at Bakery Square in Pittsburgh. It was a lot of fun. We found some gifts, had chai tea, found some cute knobs for Logan's closet doors at Anthropologie and browsed this amazing toy store. Logan loved being around so many people and he loved looking at all the Christmas lights that are popping up everywhere. It was a great family outing.